Theo Walcott's brace and a strike from the returning Lukas Podolski saw Arsenal make the ideal start to a pivotal festive period at West Ham. With three Barclays Premier League matches in six days before facing rivals Tottenham in the FA Cup, anything but victory in east London would have been a huge blow for the Gunners. It was a task Arsene Wenger's men responded to manfully, recovering from going a goal down against the run of play to triumph 3-1 at Upton Park. This was not a victory without worrying moments, though, with Carlton Cole making the most of a Wojciech Szczesny mistake to put the Hammers ahead moments into the second half. It began a spell of pressure that belied West Ham's insipid first-half display, but it was brought to an abrupt end when Walcott's shot somehow evaded Adrian. The England forward then headed home three minutes later to turn the game on its head, with substitute Podolski wrapping up victory on his first appearance since suffering a hamstring injury in August. The result saw Sam Allardyce's men slip into the drop zone and makes the January reinforcements promised by co-chairman David Sullivan look increasingly important. West Ham had begun the match at an impressive tempo, but they were struggling to cope with the visitors on the counter. Arsenal's first chance came after seven minutes when Santi Cazorla, the only change from the side that faced Chelsea, ended a fine break with a shot James Collins did well to block. There was no respite for the Hammers, though, with Bacary Sagna floating in a right-wing cross moments later and Olivier Giroud somehow failing to make contact. Wenger's side again came close in the 15th minute, with Adrian, playing ahead of Jussi Jaaskelainen, denying an impressive, if peculiar, Cazorla header from the edge of the box. Arsenal counterpart Szczesny also had to be alert in the early stages to claw away a Mark Noble free-kick that had been floating into far corner. It was the Hammers' only chance of note until the 25th minute, when Diame burst forward on his own to unleash a long-range drive - rare respite for the struggling hosts. Arsenal were remaining patient as they looked to turn their dominance into the opening goal, with Walcott coming close with a cushioned volley from a delicious Aaron Ramsey ball. Cazorla saw a left-footed drive drift just over as the visitors continued in the ascendancy, before Giroud somehow failed to make it four goals in three appearances against the Hammers when miscuing when put through on goal. As if things were not already tough enough for the east Londoners, Allardyce was forced into a defensive reshuffle seven minutes before half-time after Collins sustained an injury. Unsurprisingly, the changes did little to stem the Arsenal tide. Ramsey continued to prove a threat, Mikel Arteta flashed a half volley inches wide and then Giroud somehow missed the a drive cross from Kieran Gibbs. Arsenal should have been home and hosed by this point, yet their inability to score saw them behind less than a minute into the second half. A tame Noble effort looked simple for Szczesny, yet the Arsenal goalkeeper inexplicably fumbled allowing Cole to slot home. 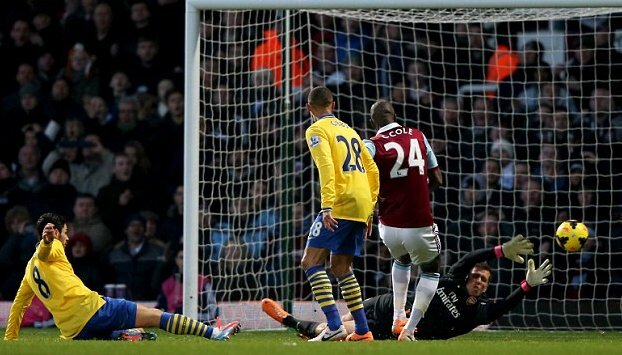 It was a shocking goal to concede and one that seemed to boost West Ham. After Per Mertesacker saw appeals for handball, the visitors were caught napping at the back and Matt Jarvis forced Szczesny into action. It did not stop there either, with Joey O'Brien heading wide after meeting a fine Diame ball from the right. Moments later Cole came closer still, meeting a fine Razvan Rat cross and prodding just wide under pressure. Having recovered from the initial shock, Arsenal began to settle again as the match entered the final 30 minutes and only a goal-line clearance prevented Cazorla levelling. Adrian did fantastically to deny Mesut Ozil soon after, with the Spaniard recovering well having fumbled Cazorla's initial strike as the visitors upped the ante. The former Betis goalkeeper atoned for that error, but paid for another costly lapse in the 68th minute. Walcott cut in from the right and unleashed a hopeful strike that slipped through Adrian's grasp, perhaps after taking the slightest deflection on its way through. Three minutes later the match was turned on its head. Podolski, brought on after Ramsey took a knock, swung in a fine cross from the left and Walcott ghosted in to power home a header from close range. It was quite the impact by Podolski in his first appearance since August 27, but looked like he would be denied a goal on his return after a good attempt was denied by Adrian. There would be a goal for the German, however, as Giroud held up the ball for him to bury a strike into the bottom corner to put the game out of sight. Nicklas Bendtner, another substitute, put just wide as Arsenal threatened a fourth, but fortunately for West Ham it never arrived.